The discussion of the importance of diversity in children’s literature has been ongoing for decades, but has become much more visible over the past few years. The conversation — spurred further into the spotlight by the grassroots We Need Diverse Books campaign — has recently gone beyond looking at the diversity of characters within books by focusing on diversity of the authors behind the books as well. Last year, Corinne Duyvis (young adult author of the upcoming On the Edge of Gone, and my fellow editor at Disability in Kidlit) created the hashtag #OwnVoices on Twitter. This hashtag is a useful shorthand for books with diverse characters that are written by people who share those identities, and it’s been widely embraced within the kid lit community. Why are #OwnVoices books important, though? We talk a lot about needing windows and mirrors for our kids — do they really care who’s behind the books? Isn’t it enough to read about diverse characters, no matter who’s writing them? In short: No, it isn’t enough. There’s a long history of majority-group authors (white, abled, straight, cisgender, male, etc.) writing outside their experience to tell diverse stories. Sometimes the characters and stories they create are wonderful! But many times, they’re rife with stereotypes, tropes, and harmful portrayals. Time and again, marginalized people have seen their stories taken from them, misused, and published as authentic, while marginalized authors have had to jump hurdle after hurdle to be published themselves. Many feel they must fight to receive even a fraction of the pay, promotion, and praise that outsiders get for writing diverse characters’ stories, and that’s when they’re allowed in the door at all. For instance, I’m a wheelchair user. 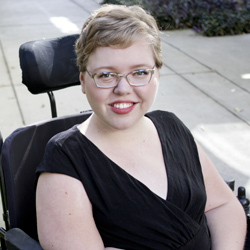 I’m intimately familiar with enduring and combating ableism, navigating an inaccessible world, exploring disabled identity, and embracing disability pride. I know not only which tropes to avoid, but how much those tropes hurt — because I’ve been hurt by them before. I can list a whole host of tiny everyday details about the physical and emotional reality of my disability that secondary research is unlikely to surface. I have a lifetime of experiences — positive, negative, neutral, and complicated mixtures of all of the above — to draw from when I write a fuller, more authentic wheelchair-using character. Of course, none of this is to say that authors shouldn’t write outside their own experiences. When we talk about #OwnVoices, it is not about policing what authors write. It’s about being aware of the stories we as readers seek out and promote, and about carefully considering the perspectives of the people who write those stories. Given the history of marginalized groups being spoken about, and for, in all areas of society, it’s especially important that we don’t ignore diverse voices by focusing only on diverse content. To help make the search a little easier for you, here are some #OwnVoices recommendations to start you off. All of the following are written by authors who share the disability depicted in their books. I mentioned this one earlier, but I’d be wholly remiss if I didn’t include the #OwnVoices creator’s newest book on this list. Set in Amsterdam, this is a tense apocalyptic novel following an autistic girl trying to survive after a devastating comet impact. This contemporary novel about a former ballerina recovering from an eating disorder features complex relationships, difficult choices, and one of the most compelling voices I’ve read. It’s also #OwnVoices in more ways than one, as both the main character and author are bisexual. New York Times bestselling author Kody Keplinger’s upcoming novel follows a pair of unlikely best friends — one of whom is legally blind, like Keplinger herself — on the run. Told through alternating points of view and timelines, this story is a beautiful study of an intense, difficult, and powerful friendship. A middle grade memoir written as a graphic novel, El Deafo is a Newbery Honor winner that follows Cece as she enters a new school, where suddenly she’s the only deaf student in class. These are just a few examples of excellent #OwnVoices books featuring disability, and I encourage you to seek out even more — featuring disability and all other types of diversity! Some good places to start are: Disability in Kidlit, Diversity in YA, Latin@s in Kid Lit, Rich in Color, Gay YA, American Indians in Children’s Literature, and Dahlia Adler’s many helpful lists.